Indian motorcycle market has seen a lot of growth in the entry level sport segment. The 200cc motorcycles are now well known for their efficient performance and deliver the perfect amount of power to cruise perfectly around the Indian roads. India currently has three motorcycles in this segment. TVS Apache RTR 200 is priced @ INR 97,000, and it comes with a 197.75 cc, oil cooled engine producing 20.23 BHP and 18.1 Nm of torque. It comes mated to a 5-speed gearbox and claims 0-100 kmph in just 12 seconds. The motorcycle comes with optional Pirelli tyres, 2-channel ABS and fuel injection. The new model of RTR 200 4V now comes with slipper clutch as standard. Bajaj Pulsar NS200 is a powerful 200cc motorcycle that produces 23.17 BHP and 18.3 Nm of torque. The engine comes mated to a 6-speed gearbox while it uses a better design than the Apache 200. The typical naked street bike costs INR 1 lakh and comes with 12 liters fuel tank. The motorcycle comes with optional 1-channel ABS and carries a liquid cooled engine. 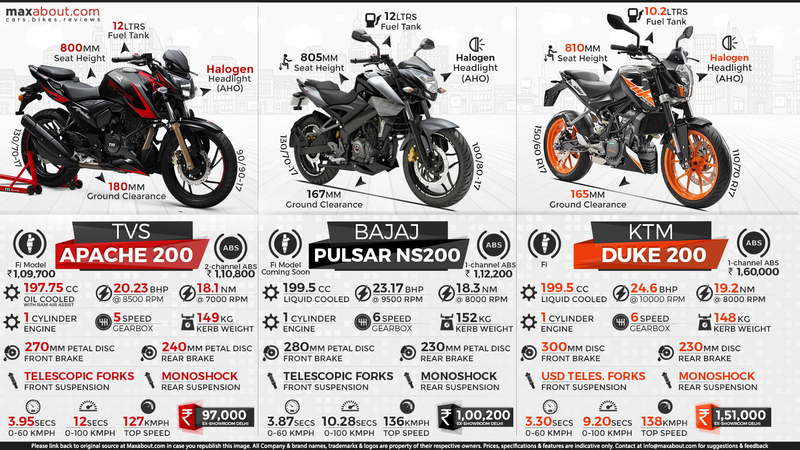 Pulsar NS200 comes as the best option for those who wish their 200cc motorcycle to perform extensively while Apache RTR 200 is for those who can afford slight performance lack at the top end. KTM 200 Duke was launched with Orange alloy wheels and now costs INR 1,51,000 (ex-showroom Delhi) in India. It carries premium components like USD front forks, wider 150/60-17 rear wheel and highly refined engine. The 199.5 cc, single cylinder liquid cooled and fuel injected engine is good for 24.6 BHP at 10000 rpm and 19.2 Nm at 8000 rpm. The motorcycle comes in three different shades and is also available with optional 1-channel ABS. These three motorcycles can be bought according to the need of the rider as all of them have different driving nature and performance aspects. Click here to know more about TVS Apache RTR 200. Downloaded 104 times this week.